Angus is a 6 year old, Patterdale Terrier. Angus is very sweet and loving with those he knows and trusts. He can be shy and nervous around people that he doesnt know and does take time to build a friendship. Angus is a total foodie and enjoys playing search and find especially if hot dogs are involved! His favourite game is chasing after his ball or running around playing with his doggy friend. Angus gets nervous when in overwhelming or busy situations so he is looking for a quiet, sensible home with someone who has had adult dogs before. 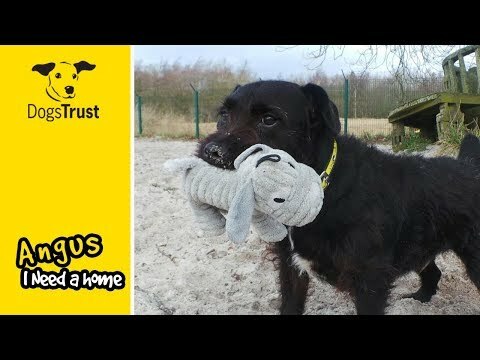 Angus is looking for an adult only home and can live with other quiet dogs. He would like regular exercise and a secure garden for off lead play. Angus is house-trained, can be left alone for a few hours and travels well in the car. Angus will need potential owners to make several visits to the centre to build a bond and get to know him. Thank you for your interest in Angus, who is based at West Calder. Please note this is not a reservation on this dog. To start the rehoming process you will need to go to a rehoming centre for a quick chat. Please find information below about what to expect during the rehoming process. We hope to see you soon.